The Suez canal revisited: 19th century global infrastructure; Operation Mulberry: A floating transportable harbour for World-war II normandy invasion; Financial engineering for the channel tunnel; Old cities and new towns for tomorrow’s infrastructure; Inland transport in Europe; Lessons learnt from major projects; Guided transport systems: Low-impact, high volume fail-safe transport; Prefabricated and relocatable artificial island technology; Command tactical information system: Military software for macro-engineering projects; Prospects for the next century: Survey and suggestions. 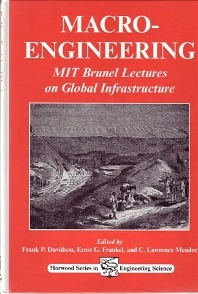 This volume makes available a reflection on large-scale engineering for building a better world. International authorities from engineering, oceanography, academia, public service, and law describe how great and imaginative concepts may be refined, tested, adapted, financed, implemented and put to use. Here are records and commentaries about some of the world's significant engineering achievements, including the planning and design of Nigeria's new capital city, and the use of software by the US military to clean up the Exxon-Valdez oil spill pollution in Alaska. Frank P. Davidson, Massachusetts Institute of Technology, USA. Ernst G. Frankel, Massachusetts Institute of Technology, USA. C. Laurence Meador, Massachusetts Institute of Technology, USA.